These whole wheat peanut butter banana crepes make for a delicious dessert that feels fancy and French but is ready in only 25 minutes! With a variety of filling and topping options from nut butter to fresh berries, this recipe is simple and customizable to anyone’s tastes. Plus, they're under 15g carbohydrate per crepe, so you can easily enjoy two to three and still have a completely diabetes-friendly meal. In a medium bowl, combine flour, milk, egg, and salt. Blend until smooth. The final consistency should be slightly thinner than pancake batter, so if necessary add a little water and mix well to desired consistency. Cover bowl with a thin kitchen towel and set aside for 5 minutes. Heat a large nonstick skillet over medium heat. Spray with cooking oil or add a tiny pat of butter to melt. Using a scant ¼ cup batter per crepe, pour batter in an even circle directly in the middle of your hot pan, using the other hand to immediately begin tilting and swirling the pan in a circular motion to spread batter until it forms a very thin film. Cook 1 to 2 minutes, until the underside is golden and edges begin browning, then flip with a spatula and cook the other side about 30 to 60 seconds until golden and cooked through. Repeat with remaining batter, adding a small bit of cooking spray or butter to pan between every few crepes. Makes about 10 thin crepes. Spread each crepe with 1 to 1 ½ teaspoon peanut butter and fold in half or quarters to serve. Top with banana slices, chopped peanuts, and a sprinkle of shaved dark chocolate. Instead of bananas, top crepes with fresh berries for a color boost and a healthy dose of antioxidants. Or, better yet, mash berries inside the crepes along with the peanut butter to make PB&J crepes, a recipe sure to please adults and kids alike. Peanut butter and apples are a match made in heaven. Instead of bananas and chocolate shavings, top crepes with warm baked cinnamon apples for a bright fall-inspired breakfast. In a Ziploc bag, combine one peeled and thinly sliced apple, brown sugar, cinnamon, and nutmeg, tossing to coat. Add apple to a medium saucepan with a pat of butter and 1 tablespoon water, cooking over medium heat until apple slices are tender. Any nut butter can be used in this recipe, such as cashew or almond butter, with the same nuts (raw and unsalted) roughly chopped as a topping. Or if tree nut allergies are a concern, sunflower seed butter is a wonderful nut-free option. 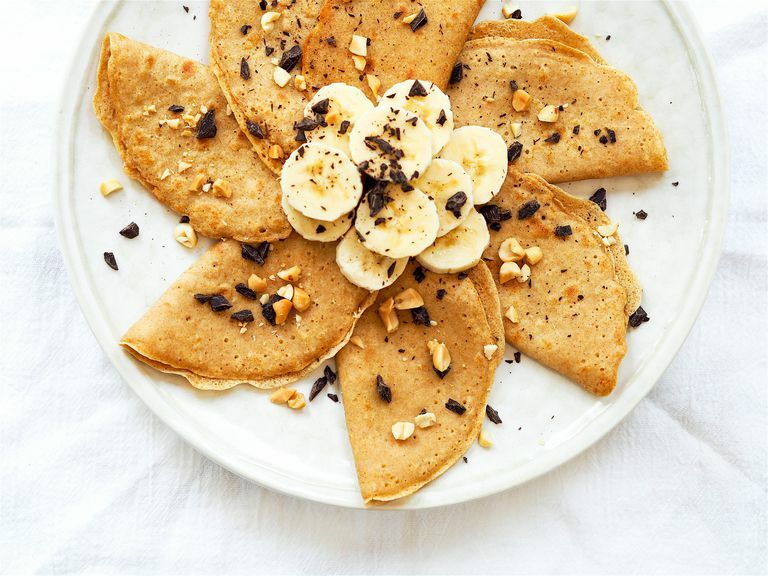 Feel free to substitute any kind of milk or milk alternative in the crepe batter as well, including popular dairy-free options such as almond or cashew milk. Just remember that these alternative milks don’t contain quite the same amount of protein as cow’s milk. And if using plant milk, look for unsweetened, or leave out the sugar. Cooking crepes can be tricky, especially the first time you give it a go. Besides immediately tilting and swirling your pan to ensure batter forms a thin film, it’s also important to use a skillet large enough to allow the batter to spread and cook evenly. Leftover crepes will freeze well—simply place a sheet of wax paper in between each crepe (do not fill with nut butter if freezing) and place stack in a freezer-safe Ziploc bag.